Virtuous Pie. Photo by Jeremy Wong. Heirloom. Photo courtesy of the restaurant. Fayuca. Photo by Areta Wong. Pourhouse. Photo by Christopher Flett. Nuba. Photo by Joann Pai. Jamjar. Photo by Marquard Photography. Roots + Fruits. Photo by Dickson Tom. Fable. Photo courtesy of the restaurant. 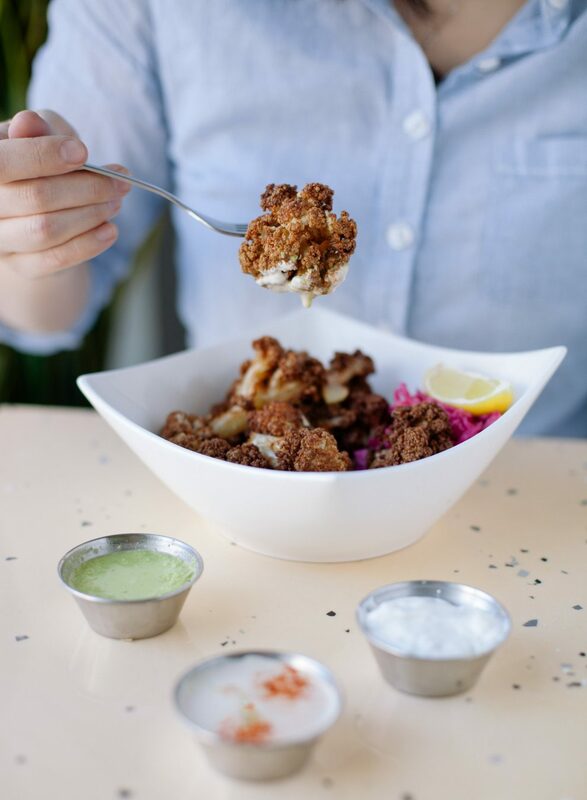 Long regarded as the flavourless vegetable that sat untouched at the dinner table on weeknights, the humble cauliflower is now enjoying its time on the menus of Vancouver’s trendiest dining spots. Perhaps its status as the new vegetable du jour was solidified thanks to its darkest days. In 2015, due to a drought in California, cauliflower’s price in Canada rose dramatically (the weak Canadian economy didn’t help, either). It happened quickly: cauliflower went from being ignored to being a luxury. Once prices dropped and the cruciferous vegetable was ushered back into kitchens around the country, though, it began popping up on restaurant menus, ordered and beloved by the masses. This isn’t just ordinary steamed or sautéed cauliflower, either—this stuff is roasted, deep-fried, or seasoned to perfection. The cauliflower dish at Jamjar is amongst that restaurant’s most popular plates, too. 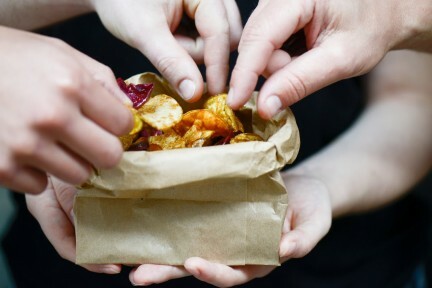 “It’s one thing we’ll never take off our menu,” Heather Giles, executive chef at the folk Lebanese concept’s South Granville location, says of the dish, called Makali (translating to “deep-fried” from Arabic). “It’s ordered by almost everyone.” The secret behind Jamjar’s creation is the pomegranate molasses dressing, which the florets are tossed in before hitting the tables—a tradition, Giles explains, originating from Armenia. She notes the importance of cauliflower to this part of the world, and in particular to the Levantine region, where people share extraordinary foods, flavours, and culinary traditions. 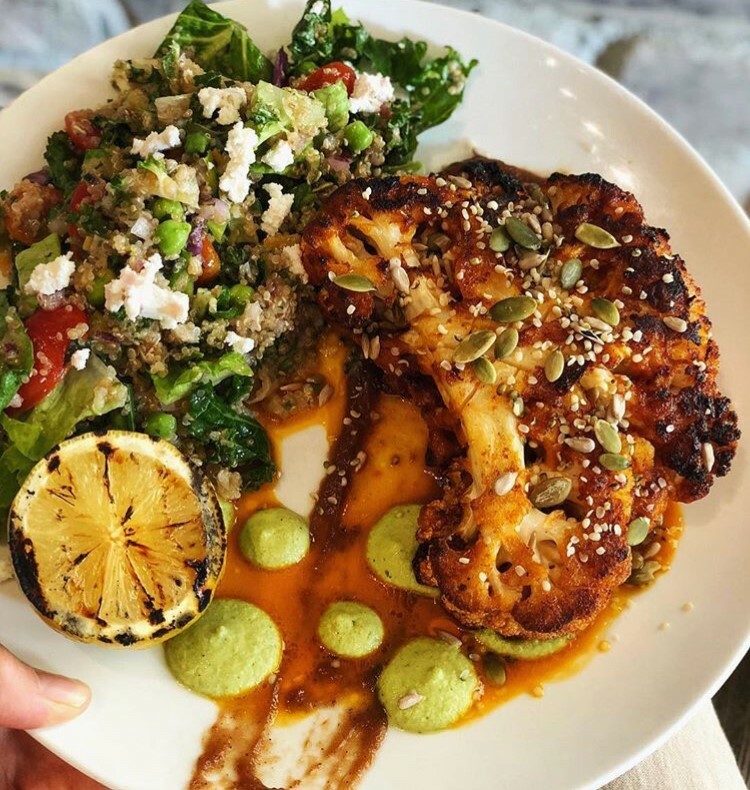 And it’s not just the Middle Eastern diets that thrive off of cauliflower dishes—the Latin palate does, too, and that’s exquisitely exemplified at Yaletown hot spot Fayuca. The restaurant, which celebrates the cuisine of Mexico’s Northern Baja, dishes up a cauliflower main that will leave even the carnivores wowed. Grilled and placed on a bed of caramelized onion puree, a whole head of cauliflower is brushed with green adobo and topped with almond salsa verde. Although it may seem odd to dig into that much cauliflower, the vegetable is soft and textured, exploding with unexpected flavours that make it easy to finish. For something else in the realm of Mexican food, head over to Strathcona’s plant-based cafe Roots + Fruits. 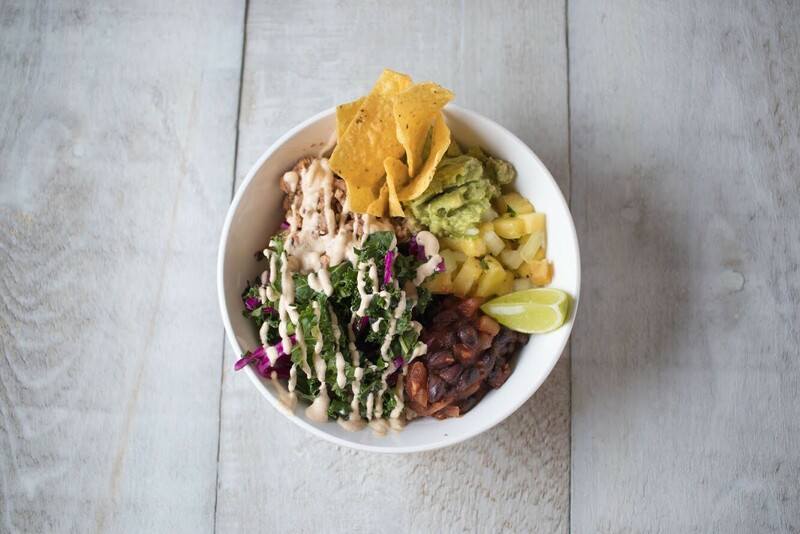 The Southwest Bowl, filled with guacamole, pineapple salsa, and chipotle crema, sits on walnut cauliflower meat, chopped finely and mixed with tofu for that dense consistency. 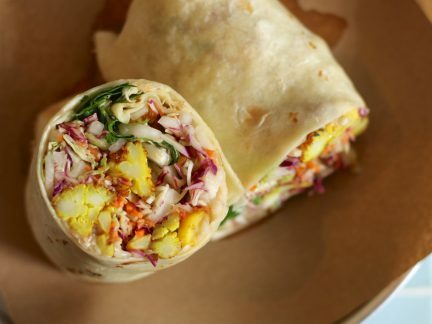 Cauliflower’s recent renaissance might have to do with the fact that plant-based diets are on the rise in Vancouver. According to a national poll conducted by Dalhousie University in Halifax and released in March 2018, 7.1 per cent of Canadians are vegetarian; British Columbians specifically are three times more likely to consider themselves vegetarians or vegans than those in Atlantic Canada or the Prairies. 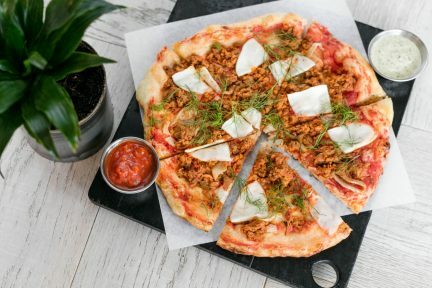 One local eatery that has been navigating the plant-based waters effortlessly is Virtuous Pie, which opened a second Vancouver location in UBC’s Wesbrook Village (the original is on Main Street in Chinatown; there is also one in Toronto and one in Portland). 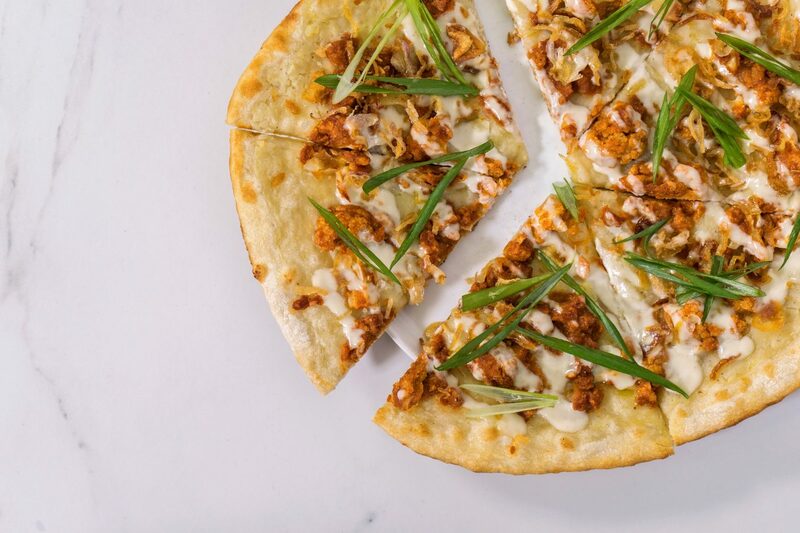 The wildly popular Stranger Wings pizza is a non-threatening way to embrace meat-free eating, with roasted bite-sized cauliflower chunks coated in chickpea flour batter and dressed in a Sriracha and barbecue sauce; it tastes, amazingly, just like hot chicken wings. The pizza’s Bianca sauce, inspired by a classic Italian white sauce, ditches the cream and instead uses steamed cauliflower to create its rich base. 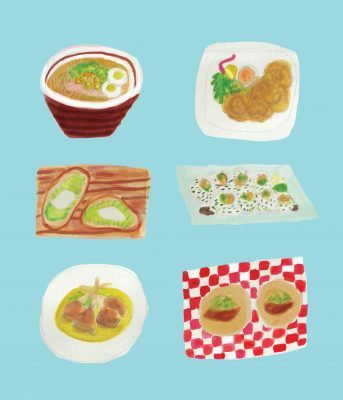 Then there is South Granville’s Heirloom Vegetarian, another must-try spot serving some of the city’s finest non-meat dishes. 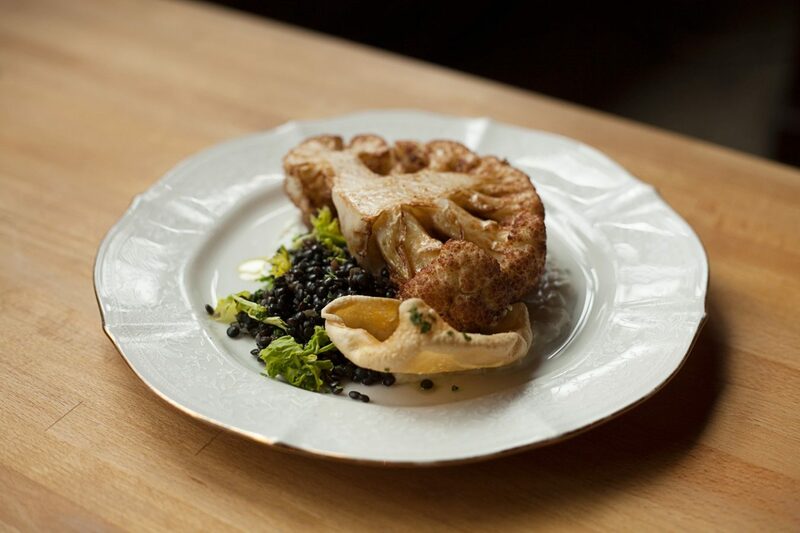 Among the menu favourites is the cauliflower steak, a delicious cross-cut, oven-roasted cauliflower that is also smoked on a hot cast iron pan. The crisp “steak” is then dressed with a tamarind raisin puree, served with a quinoa tabbouleh, and topped with green garbanzo beans, hemp hearts, sunflower seeds, and pumpkin seeds. 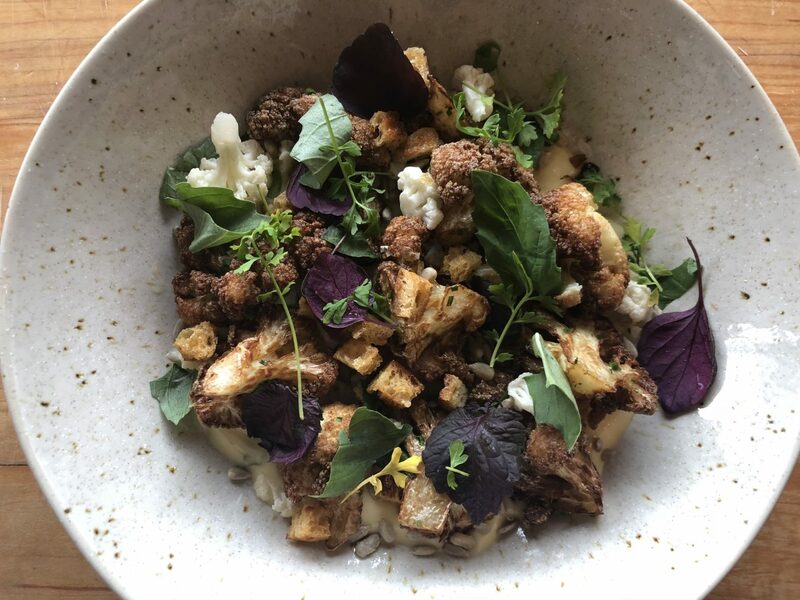 “Cauliflower is just a really, I hate to say it, easy ingredient,” says Heirloom chef Michael Ferreira. “It’s super neutral, so wherever you want to go with it, you’re never going to worry about stepping on the cauliflower because it’s always going to take on what’s given to it.” And cauliflower steak isn’t just for vegetarian restaurants—Gastown establishment Pourhouse (known for its hamburger) has its own version, perfectly soft on the inside and crispy on the outside. It features an exquisite romesco sauce, stewed beluga lentils, and toasted almonds. 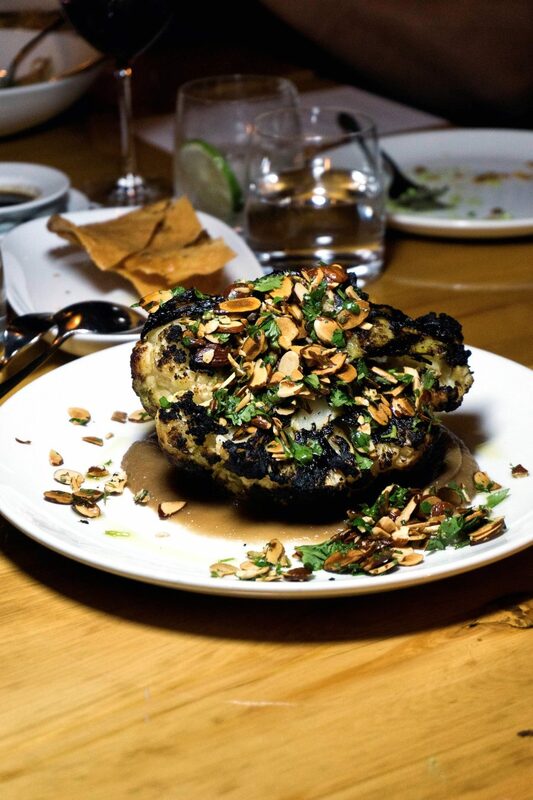 Chef Trevor Bird of Kitsilano’s Fable recently added roasted cauliflower with basil mayo to his menu. He describes the fibre-filled vegetable as a “sponge” able to soak up whatever is paired with it, all while retaining its texture. 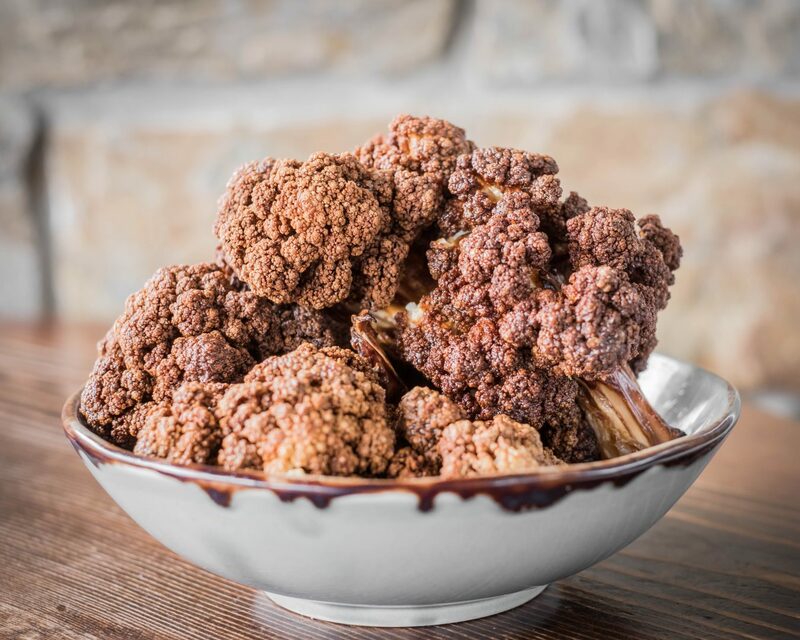 Mark Twain once said that “a cauliflower is nothing but a cabbage with a college education.” As cauliflower enjoys its time in the limelight, chefs in Vancouver are already thinking ahead: what vegetable trend awaits us next? Funnily enough, according to Pourhouse chef de cuisine Brandon Frederick, it’s cabbage.